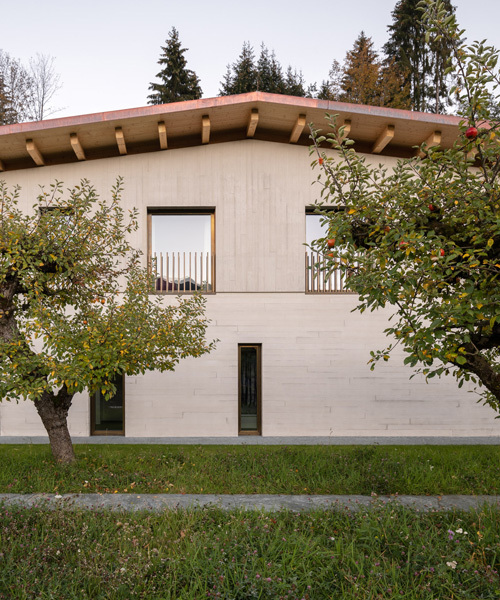 the residence offers a fresh take on traditional alpine architecture. 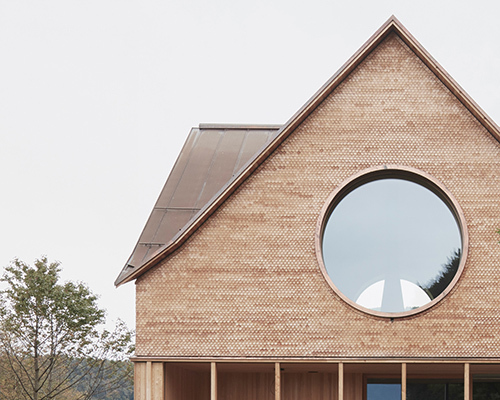 daylight enters the room through three large, circular windows, each of which faces a different direction, inviting different landscapes into the room. 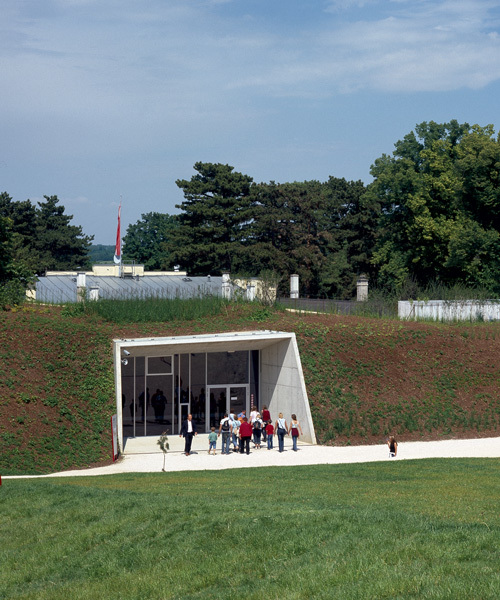 the project is part of a private memorial site built in honor of the imperial and royal austrian army. positioned on a site of cultural and historical heritage, the project aims to combine old with new. as hermetic cubes, the new additions are self-confident and formal in their uncompromising manner. the minimal concrete and wood project houses both animals and humans, combing an apartment, a veterinary practice and stables. the 35 sq-meter, one-room-apartment is finished with a rotating facade that allows it to transform from an open space to an introverted hideaway. first look inside 007 ELEMENTS, the new james bond cinematic installation opening in solden, austria on 12 july 2018.
set within the scenic mountain panorama the project is an extension to the numerously awarded high-end restaurant 'wirtshaus steirereck'. 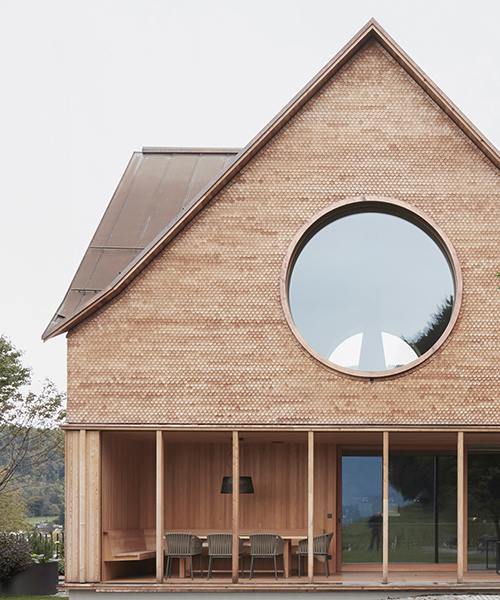 its grass roof meets the ground as the contorting concrete envelopes the banner of windows, wrapping around the oval-shaped building. surrounded by black settings, the paintings are spotlighted and bring you to some mysterious tropical forest. 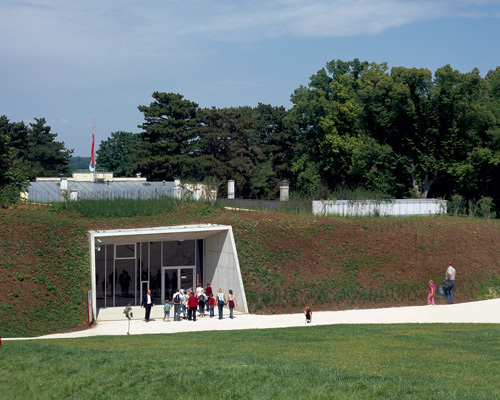 the building comprises two main components: a box-shaped plinth that can be used for events, and a two-storey exhibition area that floats above. the upper level determines the approximately 120 m² generously designed living space, extendable into a surrounding terrace, from which you get a great view through the garden below. traditional austrian oratories are spaces for the celebration of masses and the consecration of farmers and their livestock. the shed-like appearance is emphasised by the steeply-pitched roof, while inside a showroom layout has been applied to invoke a sense of being at home. the expansive, open-plan interior is spread across two floors and characterized by a concrete staircase that divides the contemporary loft into two. four structures, each serving different functions, are grouped around a spacious courtyard, which accommodates three 25 meter-tall salt silos at its center. 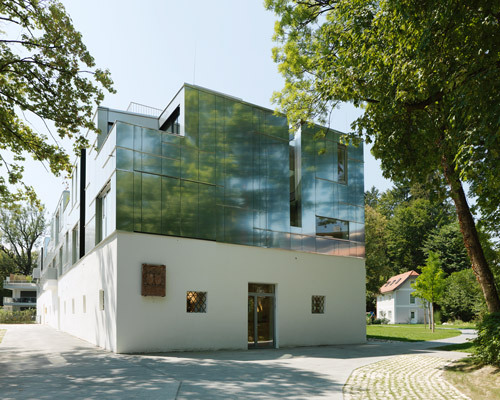 by linking the old historic part of the house to the new structure, architects create contrasting spatial experiences. each of the three levels within this contemporary residence boasts a scenic view through the floor-to-ceiling glazing which is embedded into the mountainside. we spoke with the vienna-based director as well as sound designer stefan hoffmeister about how they created the distinctive film series. the contrasts of colors, lines, textures and materials create a dynamic spatial setting. launched exclusively on designboom, three new films take a closer look at the most distinctive works by the austrian studio. 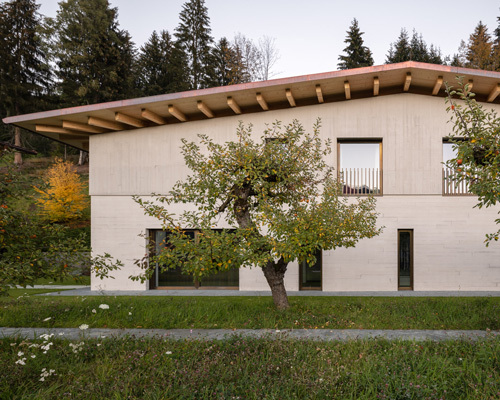 the design of the austrian house offers a unique blend between vernacular and contemporary architecture.